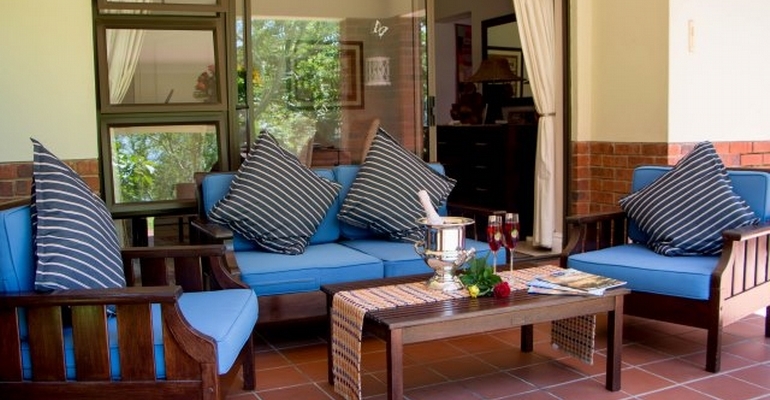 Chameleon Corner is a 3 bedroom, self-catering guest house villa in Selborne Park Golf Estate with a beautiful garden offering guests a lovely view from the undercover, furnished veranda with built-in barbeque / braai. The lounge is modernly furnished with two double seater couches, side tables and a minimalistic display unit with a large flat screen TV and full DSTV bouquet that ensures guests never miss out on those important sporting events or favourite shows. Open-plan to the lounge is a dining area with 8 seater dining room suite which leads out to the veranda. The modern kitchen adjoins the dining area, has beautiful marble counter-tops and is fully equipped for all your self catering needs. The spacious main bedroom upstairs has a double bed and overlooks the golf course through large windows. The guest bedroom upstairs has twin beds and is en-suite. The downstairs bedroom has twin beds is en-suite and looks out over the manicured garden area. Guests staying at Chameleon Corner are invited to make use of the fabulous facilities at Selborne Park Golf Estate. Aside from the immaculate 18-hole golf course there is also a swimming pool, tennis courts, children’s play area and a restaurant & bar where delicious meals can be enjoyed daily. Surrounded by electric fencing & with 24hr security, nature lovers are sure to enjoy a variety of small animal life such as Duiker, Bush Buck and Mongooses, and over 160 species of bird life.